Rapunzel, Rapunzel, let down your hair. On second thoughts, would you mind not? You see, you’re swishing it about and it’s touching me and that makes me feel the sort of nauseous rage that usually results in something getting set alight. I’m not alone in this sentiment; several others have confided in me that the sensation of a stranger’s hair against their bare naked skin makes their flesh turn to ice and their stomach turn to vomiting. It’s not just me, it’s a thing. 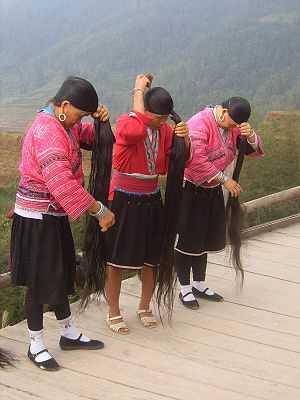 Luscious lengthy locks look glorious. It’s little wonder that the bearers, male and female, are so proud of their head of abundant silken hair, but what they don’t realise is that this causes them to be a menace in confined spaces, especially with their need to constantly groom themselves, like a cat with ADHD. Board any tube train or bus and you will spot them, preening and stroking their treasured tresses, some even going so far as to break out the brushes and combs for an extended session of hair care. This is all well and good in the sanctity of one’s boudoir, but all this flicking and tousling means the rest of us are subject to having our faces and limbs whipped at by highly perfumed horse tails. During the warmer months week of the UK seasons, when my flesh is most exposed (a scandalous hint of shoulder and a brazen suggestion of ankle), I live in constant fear of the cold tickle and twitch of a stranger’s split ends upon my skin. I’m sure these trollops are very clean and use perfectly effective shampoo, so it’s not a fear of their having hair herpes, it’s just a vile sensation and far, far too intimate. If I know you, I will gladly touch your head without fear of catching anything, but if we haven’t met, your errant strand of hair that came swishing across my arm may as well be a tramp’s sock filled with used hypodermics, and you could at least buy me dinner before dragging one of those across my flesh. With all this swishing and preening, like an over-enthused pony in a L’Oreal advert (because you’re worth it), these lengthy strands of dead skin cells shake loose and take flight, sailing aimlessly across the train carriage/pub/space capsule, until they find their prey and tickle them with vain arrogance, bettered by the stray hair that finds its way into your sandwich, to be picked out at arm’s length in slack-jawed disgust. Is there any feeling more upsetting than choking on a hair that is of no colour you’ve ever sprouted, pulling its seemingly endless length through a mouthful of well chewed lunch? Actually yes, there is, and that feeling was the one I experienced on emerging from a pool in Las Vegas, Ursula Andress style, to find someone’s rogue drowned hair extension wrapped mercilessly around my ankle. I’ve since quit ankles. There really is no need for hair to be brushed on public transport, or in any public arena other than a hairdresser’s salon. All this twitching and flicking of hair is pure self-absorbed vanity and caused by a deluded notion that other people regard the swisher as being a sexually alluring, mermaid-esque object of hirsute desire, beguiling their suitors with a shower of cuticles and dandruff. Style your hair at home, detangle it in the privacy of your lodgings, tweak and tease your temple tendrils in your own lavatoire, and if your swishing is the result of your luscious locks getting in the way of your daily doings, perhaps you’ve heard of these new-fangled inventions called “hair bands” and “hair grips”? And if you still have trouble controlling your tresses, may I suggest one of those revolutionary modern concepts, the haircut? Call me neurotic, call me weird (just don’t call me after 23:00 as I’ll be trying to sleep), the touch of a stranger’s hair on bare skin is like the sensation of grasping a moist toilet door handle – it’s probably clean but wholly repugnant. I’d like to think people wouldn’t clip their toenails on the tube and fling them at their fellow commuters, but that’s pretty much what these wobbly-necked wenches are up to with their swishing and shedding (that’s not fanciful, that’s science – hair and nails, made from the same stuff). If you have long hair, the next time you’re tempted to swish and flick in public, just remember that it makes me feel the sort of nauseous rage that usually results in something getting set alight, so I do hope you enjoy the scent of burning hair. Posted in Uncategorized and tagged Beauty, Comedy, Hair, Hair care, Humor, Humour, Long hair, People, Rapunzel. Bookmark the permalink.